Today, The HSUS released results of its investigations into two shoddy roadside zoos: the Natural Bridge Zoo in Natural Bridge, Virginia, and Tiger Safari in Tuttle, Oklahoma, both of which breed tigers for two-bit photo shoots with paying customers. The cruelty, neglect, and suffering that characterizes such operations is not well known, but thanks to our undercover investigators, we got a detailed behind-the-scenes look at two of the worst such menageries in the nation. They are not accredited by the reputable Association of Zoos and Aquariums and they are operated by unscrupulous owners and amateur animal handlers who cut corners and exploit animals so that their ramshackle outfits can turn a profit. Customers who turn over cash for these tawdry experiences often have no idea that they are supporting deprivation, harassment, and even outright cruelty to animals. Both these roadside zoos breed tiger cubs for the spring and summer seasons to attract members of the public who want their photo taken with a tiger cub. It's a lucrative business, and people pay fees ranging from $50 to $1,000 for these photo shoots. Tired, overheated, thirsty, hungry, or sick cubs are expected to sit still for a parade of paying customers, and are often physically disciplined to ensure that they do so. Our exclusive undercover video provides a glimpse of the suffering the cubs endure, and the entirely unnatural torment they endure day after day. 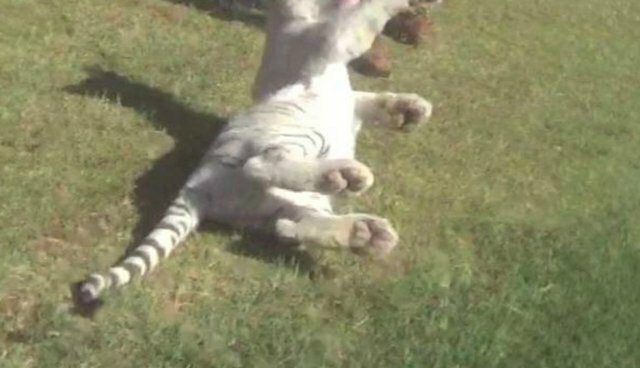 At the Oklahoma-based Tiger Safari, a white tiger cub named Maximus was dragged, punched, choked, slapped and deprived of proper food and nutrition that is essential for a carnivore of his age. As a result, his leg bones began to bow. A coworker shed tears as she told our investigator about Max's mother crying for days after her cubs were taken from her. Owner Bill Meadows professed to love Maximus and told the public that he only allowed a couple of public encounters each day out of concern for the cub when, in fact, Max was handled by dozens of people daily. On one day he was forced to do 60 photo and play sessions, when he really should have been spending time with his mother and litter mates. The investigation also revealed that Tiger Safari picked up a female tiger cub from an enterprise called T.I.G.E.R.S. in Myrtle Beach, South Carolina, run by Kevin Antle, a sort of kingpin of the exotic animal trading world. Antle gives and takes cubs from both Natural Bridge Zoo and Tiger Safari. We don't know if any money changes hands; it's a secretive business and, unbelievably, these animals are bred indiscriminately all over the country and not tracked by any one agency for their lifetimes. They could be going anywhere, to an uncertain fate that might even include being slaughtered for their body parts. At Natural Bridge Zoo, two tiger cubs, Daxx and Deja, were slapped around by their so-called caretakers. In our video you can see Deja's head hit a concrete floor as she is disciplined by a man sitting on the floor (WARNING: Graphic content). Both of these cubs were sick with coccidia and giardia but never saw a veterinarian and were starved until photo sessions started up for the day so the bottle could be used to mollify them during handling. There were other problems at Natural Bridge Zoo: a dead giraffe, a dead Mandrill (an endangered primate), a baby camel who accidentally hung herself, a dead capuchin monkey and terrible injuries to other animals, including a bone-deep hand wound suffered by a spider monkey. There's also a lone elephant who is confined in a dark barn when she isn't being forced to give rides to the public. What's more, this place breeds primates and pulls the infants from their mothers for sale to the pet trade. We've got a bill pending in the Virginia legislature to put a stop to this dangerous, thoughtless, and cruel activity. The HSUS filed complaints with the U. S. Department of Agriculture against both these roadside zoos in 2014 and provided time for the agency to do its investigation before going public with the findings being shared today. We are also asking the USDA to act on our petition filed in 2012 to ban public contact with big cats and other dangerous wildlife, which would put a stop to this terrible and reckless overbreeding and mistreatment of tiger cubs just for photo ops. Neither the states nor the federal government should tolerate these types of operations, and the laws should speak. So should consumers, who ought to avoid these operations, and many others like them, at all costs. We've been investigating and exposing substandard wildlife attractions like these since the early 1970s, which are responsible for some of the worst animal suffering you can imagine. The violence at a cockfight or a live pigeon shoot is certainly more acute and obvious, but the outcomes for animals at such roadside zoos is almost always bad - typically pain and death for animals who never deserved this kind of enduring privation and misery. Top Photo: The tiger cubs endure unnatural torment, including being dragged, punched, choked, and slapped.